Max’s interest in glass on an artistic and technical level began early in life, although it was not until 2010 that he began to practice flameworking. His first lesson with artist Dywn Tomlinson allowed him to create rather than simply admire the work of others. Limited by the properties of soft glass (as introduced by Tomlinson), Max was drawn to borosilicate for its ability to handle thermal shock and its clarity in encasements. Another local artist, Kent Dale, was instrumental in Max’s transition from soft glass to borosilicate. After his introduction in borosilicate Max began working on his own, experimenting with different techniques through demonstrations in person and online. 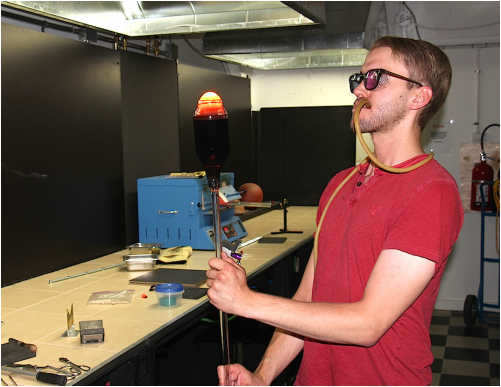 In 2013 Max attended Fleming College, enrolled in the glassblowing program. The intensive program allowed him to work with glass daily, letting him further develop his skills as an emerging glass artist. Upon completion of the Fleming glassblowing program, Max enrolled at Sheridan College, the institution he currently attends, taking the Crafts & Design Glass program as the next logical step in his artistic career . Being both an off-hand glass blower as well as a flameworker has given Max a better understanding of the medium as a whole and allowed him to create a diverse portfolio. Max’s unique approach to the art form can be attributed to his work in both the hot shop and flameworking studio. When he is not at school or at the Toronto Flameworking studio, Max can be found building upon his knowledge at demos, conferences, and gallery shows. Kirill has experience flameworking for a little over 4 years. His confidence developed while studying glass at Sheridan college. Taking part in workshops taught by artists such as Elbo, Snic and Matt Robertson (ME Glass) have helped push Kirill towards creating a higher quality of work. Kirill currently continues to explore glass techniques, working with the Down Under Glass kangaroos, constantly looking to refine the form and function within the work. Not specializing in any one style from the start has enabled Kirill to work on becoming a well rounded glassblower over the years. He has found sculpting and assembly to be very enjoyable elements to the creative process. The possibilities to create anything you can think of are available, it's just a matter of finding a formula that works for you to achieve that vision.